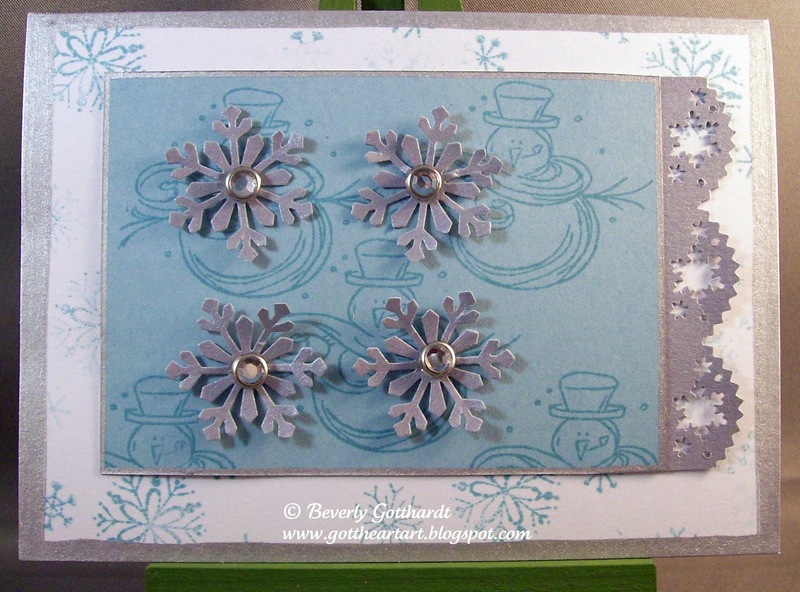 A card inspired by a Rosemary Clooney Christmas song, for all you youngsters, that's George's Aunt. When Christmas songs were fun to listen to and sing along. Suzy's coming along to help us all build a Snowman. Maybe somewhere, but probably not Central Texas. We had a white Christmas last year, but that was very rare. 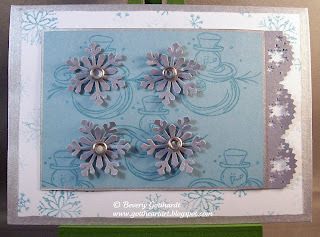 Supplies: White Card Blank 4" X 5 1/2" Halcraft, Papers: SU-Brushed Silver, Baja Breeze, Stamps: CTMH-D1226 Magical Season, Fiskars-Winter Wonderland, Ink: SU-Baja Breeze, Sharpie Paint Pen-silver, Martha Stewart snowflake punches, Recollections-brads. What peaceful colors ... love those blingy snowflakes ... what a fun little snowman background ... so glad you joined our jingle belles fun. Fun Christmas card, Bev, and you know, you are sp right about the songs, too. My favorites are all the old carols and songs!